It has taken me several months to write this post, partly for lack of free time, but I think mostly because I’m still in denial. In October, I had to say goodbye to one of my very best friends in the world, Dorie. 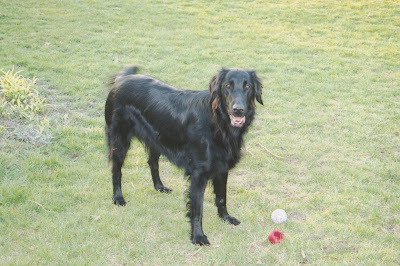 I’ve written about Dorie before, she was my parents’ Flatcoated Retriever. Dorie was my special girl, but she was special in her own special way. 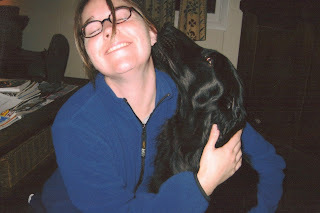 She wasn’t like my other best friend Flatcoats, Buck or Sage, who were both very outwardly affectionate, loved to cuddle and weren’t shy about sharing their love with you. Dorie didn’t like to cuddle. She’d jump into bed with you, but would only stay as long as you didn’t move. At the slightest toe wiggle or gentle inhale, she’d bolt. And if you tried to hug her, she’d pull away, shifting all of her weight into the weakest point of your embrace, hoping to break the link and run free. But she’d melt your heart with her loving stares. We’d be sitting in the living room at night watching TV and all of a sudden I’d get that feeling that someone was looking at me. I’d look up and catch Dorie staring straight at me with a focused and intent look, as if she were trying to connect with me telepathically. But I didn’t need some form of extrasensory perception to know what she was trying to say. I could feel it in my bones. It was the kind of stare that brings tears to your eyes and gives you goose bumps. She was sending love, a love so deep and pure that a mere glance from her would send a shockwave of bliss rippling through you long after the connection between your eyes was broken. Dorie didn’t need a physical touch to express her affection, she just needed her eyes. Last year was a very hard year for my parents. Of their three Flatcoats, they lost two. Sage’s death rocked us all to the core. Anyone who is an animal lover and has lost a best friend will truly understand the depth of that pain. But we weren’t the only ones affected by his loss. Dorie suffered too. Sage was her best friend. We weren’t the only recipients of those loving stares, Sage got them also. You could read the look in her eyes with stark certainty – with all of us close to her, all was right in the world and she was truly in her own utopia. But when Sage was gone, a piece of her was missing, an important, foundational piece. And without it, Dorie just couldn’t survive. She died 5 months to the day after Sage. 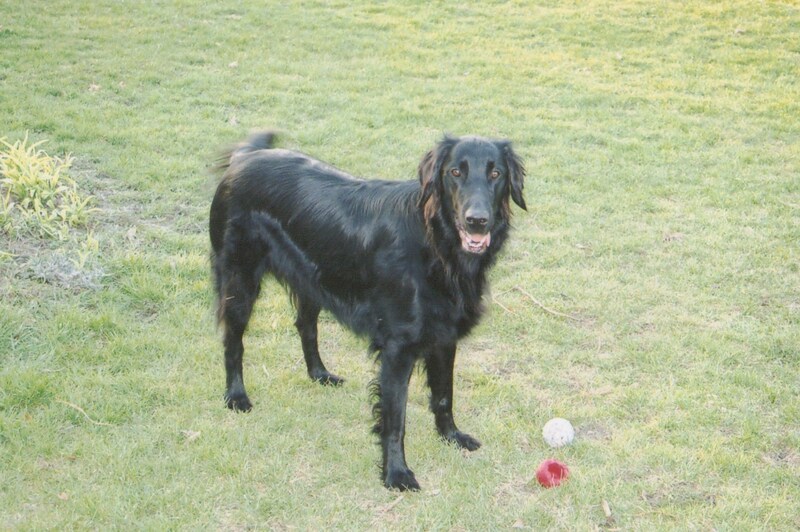 Dorie’s cause of death was tumors that ruptured in her chest. But my mom swears – and I agee – that Dorie truly died of a broken heart. Love is a powerful thing. When we have it, we feel invincible. When we are separated from it, we will move mountains to be reunited. Sometimes, however, we take it for granted. We believe it will always be there and instead of being constantly celebrated, it gets lost in the shuffle of life and tucked away, like a once-treasured item from our childhood that gets packed in a box and put into storage. Losing Dorie and Sage has taught me a lesson to stay rooted in the moment, enjoy every second we have together, because things change and sometimes we don’t get the chance to pull those boxes out of storage and rekindle the excitement for the things we packed into them. This February marked my 8-year anniversary of moving to Minnesota. I love the home I’ve made for myself here, but I am also still very homesick – some days more than others. The arrival of Lucy in our lives has made it immensely harder for me to be six long hours away from my family. In the past eight years, I have sought so much comfort in knowing that when I arrive home I will be greeted at the door by three very enthusiastic barking, jumping dogs that are ecstatic to see me (two of them were at least. The third, well, she only has eyes for my dad). Immediately upon arrival, I would be covered in slobber, have dirt streaks down my pants in the faint form of a smeared dog foot and red scratches on my stomach from Dorie’s nails as she desperately tried to be the first one to greet me. Every time I left, I would fall into Dorie and Sage with huge hugs. Sage loved every second of it and grunted his pleasure. Dorie endured it, but I secretly think she savored those moments as much as I did. Now, however, when I go home, it’s quiet. 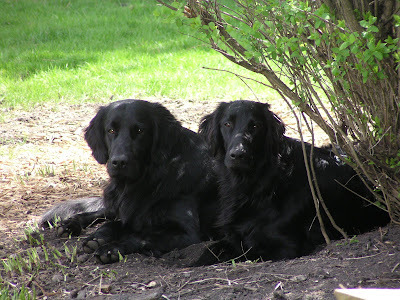 Until, of course, my parents see Lucy and shout out their enthusiastic hellos or Lucy sees Nell, the remaining Flatcoat, and squeals out her delight at seeing a dog (it doesn’t matter that the dog doesn’t care to see her). There is no slobber. My pants stay clean a little longer. My stomach no longer bears the temporary tattoo of a dog’s deep and true love. I will never forget the last time I said goodbye to Dorie. I held onto her as tight as I could and she let me. Maybe she knew it would be our last goodbye. I cried. I held her, told her I loved her and I cried. Maybe, deep down, I knew it would be our last goodbye too. When I searched through the box for a recipe that would be fitting for my sweet girl, I knew exactly which section to look in first. When she had her surgery and we almost lost her in 2010, I made angel food cupcakes. 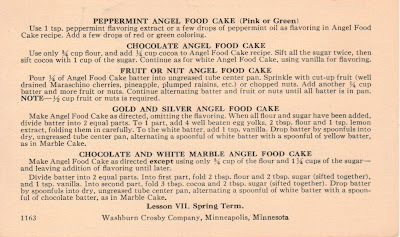 So for this post, I knew I had to do a similar recipe and I chose to make a Chocolate Angel Food Cake. 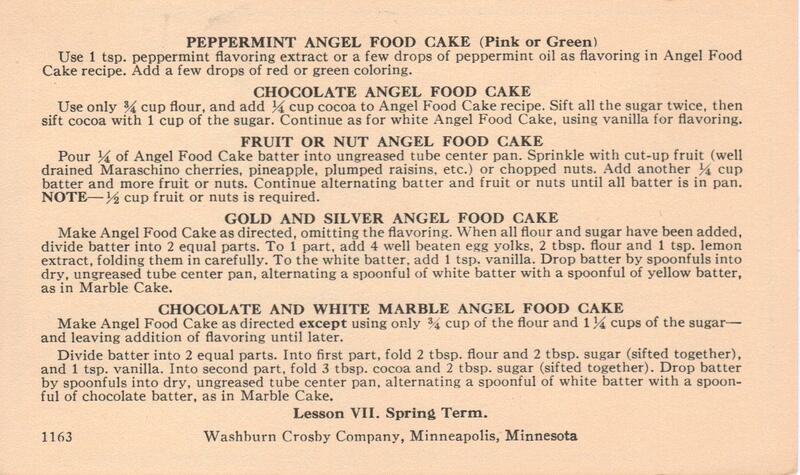 I love these cakes, they’re so easy to make and dependably delicious. Plus, there are so many ways to dress up their flavor, either by making it sweeter with a chocolate drizzle and whipped cream or the “healthier” option of covering them in fruit. 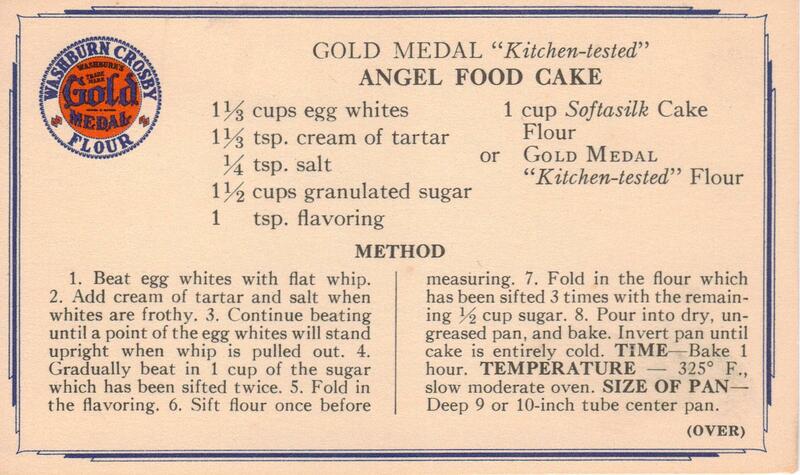 I decided to keep it simple – a chocolate cake with a dollop of whipped cream. It was one of my absolute favorite recipes in the box and I think it was a very serendipitous choice for this post. 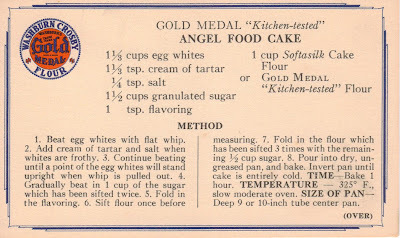 I thought of Dorie as I pulled ingredients from the cupboard, as I cracked each egg and measured out 1 1/3 cup of egg whites, as I stirred the fluffy batter, and while the cake cooled upside-down in the Bundt pan. Ironically, when it was time to remove the cake from the pan, I lifted it, patted the bottom and watched as it fell out onto the cooling rack and broke in half. Very serendipitous indeed. Even after sitting down and writing this post, I’m still in denial. I have this hope deep down in my heart that maybe the next time I go home, I’ll learn it was all just a bad dream and Dorie will be there to greet me at the front door with Sage. She’ll stain my pants and scratch my stomach. Then we’ll run outside and I’ll watch her dig holes under her favorite tree, fish for frogs in the pond, and eat the decorative grasses in my mom’s garden. She’ll bark at me when I’m not following fast enough. I’ll smile – a smile that goes straight from my face to my heart. And she’ll stare back at me – her loving stare that goes straight to my bones and makes me confident that all is right with the world because we are together. But sadly, I have to admit to myself that that is a dream that will never come true. Instead I need to find solace in the fact that Dorie has been reunited with her best friend, Sage, and her mother, Bonnie. They all met up at the Rainbow Bridge and together, they’re digging holes, fishing and eating grass. Watch out frogs, Dorie is an amazing hunter. Dorie, I miss you more than words can say. You will always be with me – always – deep inside my bones. Goodbye my sweet, sweet girl. Goodbye for now…until we meet again at the bridge.